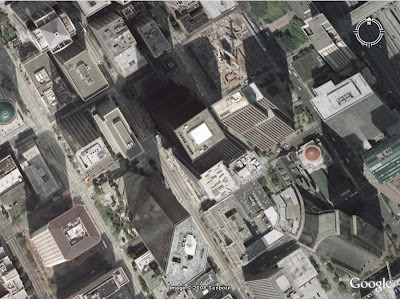 The above image is taken from Google Earth and represents a section of downtown Seattle. Now, either:Seattle has buildings which amazingly grow sideways in different directions - something I inexplicably failed to notice while walking around town;or, this image is a well-done, seamless splice of multiple images taken from different positions in the sky but at the very same time of day, so that shadows are cast in the same direction;or, this image is an even better done, seamless splice of multiple images where shadows have been corrected to all point in the same direction.What gives? Why would Google go to the effort of seamlessly splicing images and fixing shadows? And if they did not, how come the buildings that appear as from the same image are slanted in different directions, as if they were pictured from different vantage points? My wife gets severe reactions to hormones in various kinds of birth control pills, so we decided to get an intra-uterine device (IUD). Since we are (perhaps unjustly) somewhat skeptical of the quality of medical service where we live, we decided to get an IUD inserted during our trip to Seattle. We visited with Dawn Scheve at the Seattle Women's Clinic, and she turned out to be very nice - was appreciative, talkative, and appeared to have done the job well. However, then we got the bill. The cost of the Paragard device itself - though it appears high for a 2 cm plastic-and-copper 'device' - seems normal; $355 is a price I've seen quoted elsewhere. The insertion, at $199.75 - okay, I understand, it only takes 5 minutes, but you need several years of medical training in order to not screw it up.